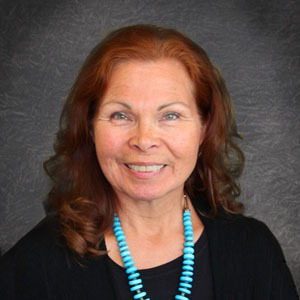 Since 1998, Ileen has served as Southcentral Foundation Vice President of Executive and Tribal Services. She manages and directs the day-to-day operations of tribal relations and village initiatives for health care delivery to 55 rural communities, traditional healing, youth and Elder programming, public relations, planning and grants, and more. Ileen contributes to regional and statewide health initiatives by building relationships on boards and committees including: Alaska Tribal Health Directors as vice-chair, Public Health Accreditation Advisory Committee, National Indian Health Board Tribal Public Health Workgroup Committee, and Alaska Native Women’s Sexual Assault Committee. She was also selected as a regional delegate to serve on the U.S. Department of Health and Human Services’ Health Research Advisory Council. Known for her unwavering commitment to Elders and youth, Ileen has dedicated herself to helping Elders achieve health and wellness goals by facilitating partnerships between the Elder program and other SCF programs. One notable partnership is primary care now has a physical presence at the Elder Program — the first of its kind in Alaska. An advocate for the youth in the Native Community, Ileen was instrumental in bolstering organization-wide support and partnership with Southcentral Foundation’s RAISE youth internship program. She encourages and teaches the interns, encouraging them to learn and become future leaders. Ileen is quick to credit the team approach for the positive changes that have been made in Alaska Native health care. She helps disseminates this approach not only within Southcentral Foundation’s Executive and Tribal Services Division, throughout the entire organization, and the network of Tribal Health Directors throughout Alaska.